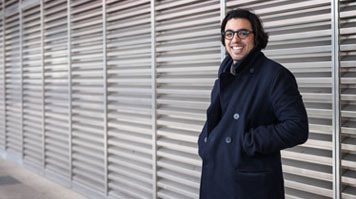 Studying part time at LSBU gave Bernardo the opportunity to experience university life while working professionally as a freelancer in CAD (Computer aided design). He now works as a site supervisor for a structural steel specialist leader, has set up a family run charity, and has great hopes for his future. While studying at LSBU, with lecturers only once a week, I created my own company in order to work as a freelancer while I studied. I have always maintained a parallel life in the professional world in order to be able to apply the knowledge acquired as a student in the professional world. Amigos da Maforga (Maforga Friends), is a charity I co-founded with my family. My grandparents had a farm in Maforga during the 1950s when Mozambique was a Portuguese colony. My father was born there and left when he was nine years old in 1961. He returned to the farm for the first time in 2012 and was happily surprised to see that the farm is now a small village with a primary school and a high school. In order to support the schools in the village, we came up with the idea of creating the Amigos da Maforga, where we gathered funds to support these schools. So far we have been able to provide 400 school books, consumable materials (pens, pencils, notebooks) and sports equipment. More work and funds are required, and the next step is to complete the supply of computers for the schools. Due to the geographic social reality, the only way to ensure that electronic equipment arrives at schools is by being there and delivering it by hand. Maintaining an active lifestyle is what keeps me motivated and allows me to expand my knowledge portfolio and cognitive development. From sports activities to reading, and going to expositions, theatre, gigs, etc, London is the best place to be for that and it is hard to find excuses to stay at home. I don’t have a five-year plan, I have a mid-term goal, to become a CEO before I’m 40. In the meantime, I am just taking in the best of the experiences I have and enjoying the ride. I believe career satisfaction comes when you are able to balance a career with your personal life. A career, as I see it, is a tool for your personal fulfillment. It doesn’t matter what career or dreams you have as long as you do what you love. The most influential relationships in my life are the ones I have with my parents, for providing me with the possibility to pursue my dreams, my older sister for providing me a stable foundation, and my long-term partner for giving me the stability and support to overcome the obstacles in my path. I am affected by stress and I believe that this is a generational feature. My parents provided me access to an endless horizon of possibilities and I can’t deny that I am a privileged individual. But the world that was shown to me as a child is not the same one that I was sent to live in as an adult. The paradigms changed radically and I need to keep up, faster than ever. That’s how I deal with stress, moving forward towards my ultimate goal, which is to make a change and leave a legacy. I ask myself, what change? What legacy? Well, I don’t know yet, but that is what keeps me motivated to keep moving forward. I have had episodes in the past, as any other individual when, I started questioning myself too much. I believe that when this happens, it is time to learn something new as insecurities usually come when we face new challenges. I have chosen to embrace the self-doubts, lack of confidence or ability, and learn new ways to leave those feelings behind in order to move forward. My hopes for the future are to provide the same opportunities that I have taken for granted in my life to people in disadvantaged communities. My advice to current LSBU students is to embrace and get the most out of your student life. Being a student is one of the most pleasurable periods in our lives. LSBU has one of the most widely available course offers in UK. It is a land of opportunities, and gives the chance for any student to follow their dreams." Potential becomes reality when you follow the path you want and by doing so success will come naturally. You can contact Bernardo on LinkedIn.